This turret had been associated with the planned Panther II. For a while it was thought to have been designed solely for it. The new turret was actually developed independently and was considered as an upgrade for both the ageing Panzer IV which was in its Ausf. J model at the time, and the Ausf. F of the fearsome Panther. The Schmalturm (English: ‘narrow turret’) takes its root from the armaments manufacturer Rheinmetall. After their attempt failed somewhat, the project moved to Daimler-Benz in February 1944. This is where the name “Schmalturm” was born. – An increase of protection while keeping the weight of the turret as low as possible. – A decrease in the overall size of the turret, while still leaving the crew room to work efficiently. – Addition of a stereoscopic rangefinder (The lack of this was one of the reasons Rheinmetall’s wasn’t approved). – The replacement of the MG34 machine gun with the newer MG42. Make it easy for conversion into a command tank version (Befehlpanzerausführung). – Make it compatible with possible IR device installation. – It should Keep the standard Panther turret ring diameter (1650mm). – Finally, Make the whole thing easier, faster and cheaper to produce. 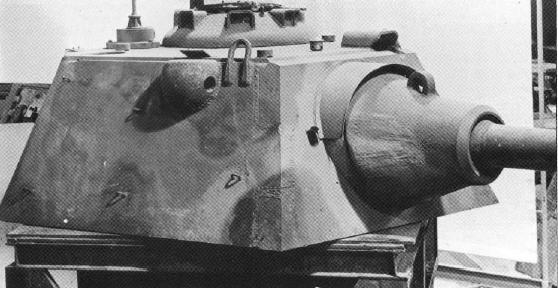 The turret granted increased armor protection in the shape of a 150mm conical mantlet leading to the 120mm front plate. The turret sides were 80mm thick outwardly angled to increase the effective protection. Despite the increased armor and narrower shape of the turm, the internal volume of the structure remained the same. The Schmalturm turret was designed to carry a derivative of the deadly 7.5cm Kw.K.42 L/70 tank gun. In order to accommodate this powerful cannon, modifications had to be made to the recoil system. Škoda of Pilsen, Protektorat Böhmen und Mähren (English: ‘Protectorate of Bohemia and Moravia’) (German-occupied Czechoslovakia) with assistance from Krupp managed to create a new version of the canon with a more compact recoil system mounted on top of the gun. This was designated as the 7.5cm Kw.K.44/1 L/70. This allowed the gun to have +20/-8 elevation/depression. The usual muzzle brake was also removed from the barrel. The Panzerkampfwagen Panther Ausf. G of the Panther were the test beds for the ‘Versuchs-Schmalturm’ (English: ‘experimental narrow turret’). The production version was to be named Panzerkampfwagen Panther Ausf.F and include several other changes. The tank needed little in the way of modification to accommodate the new turret. Several Ausf. Fs hulls and turrets were under construction near the end of the Second World War and at least one Panther Ausf. F hull mounting an Ausf G turret was known to be completed and see service defending Berlin in 1945. A further planned development of the turret, designed by Krupp in 1944, was the inclusion of the 88mm L/71 cannon, thus creating the Panzerkampfwagen Panther with 8.8cm Kw.K.43 L/71. The project was later taken over by Daimler-Benz in early 1945. In Krupp’s design, in order to mount this larger gun, the trunnions of 8.8cm Kw.K.43 L/71 the was moved forward and protected by a bulbous housing, in front of which was the conical mantlet. Additionally, the trunnions on the 8,8cm Kw.K.43 L/71´s gun carriage were moved 350mm rearwards or the gun itself was moved 350mm forwards depending on how it is interpreted. This upgrade, however, would have necessitated the enlargement of the turret ring by 10cm. It is very unlikely that this mating would’ve been a success. The already overloaded Panzer IV Ausf. J chassis would have never been able to carry the added 7,5tons of the turm. The vehicle was already at its limit with 80mm frontal armour and 7,5cm L/48 main-gun, a weight which caused bending frontal springs and forced an enormous tension on the final drives. Also, the Ausf. J had no electrical turret traverse and used a simple mechanic turret traverse with a gearing for the gunner. Early in September 1943 another concept was penned. Wa. Pref. 6 asked Krupp if it would be possible to squeeze the Panthers 7,5cm L/70 in the standard Panzer-IV turret. Krupp’s reply was as simple as “No”. Another order from April 12th 1944 demanded to equip a modernised Panzer-IV chassis with 7,5cm KwK-42 in a modernized turret, but this turret had only 50/30mm of armour and had a weight of 4,5tons. The Panzer IV mit Schmalturm would’ve been the final and most powerful form of the Panzer IV model of tank, which at the time of the turret’s development was starting to be phased out. Armed with the L/70 canon, this would have definitely been the case, and it would have improved its chances against tanks such as the T-34/85 and late-war 76mm cannon armed M4s. Tank Encyclopedia’s own rendition of a Panther Ausf. G mounting the Schmalturm turret. Rheinmetall had been tasked with designing the Panther II turret. This new turret was named ‘Turm Panther 2 (schmale Blendenausführung)’ (English: ‘Turret Panther 2 (narrow mantlet variant)’). 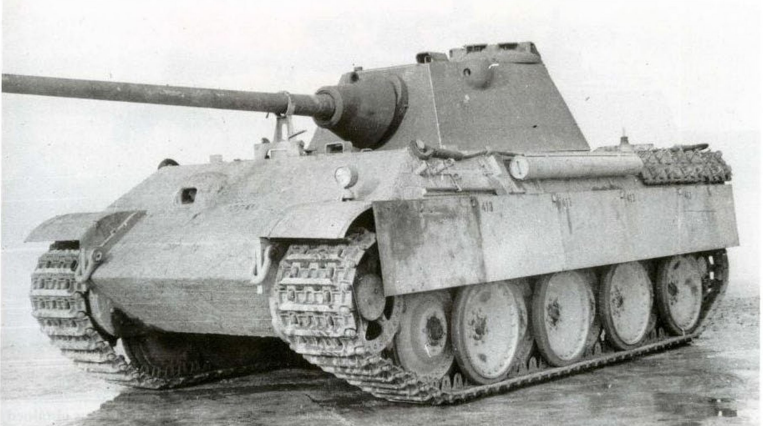 The cancellation of the Panther 2 project came in May 1943, but Rheinmetall continued their work, with their turret now destined for the original Panther. 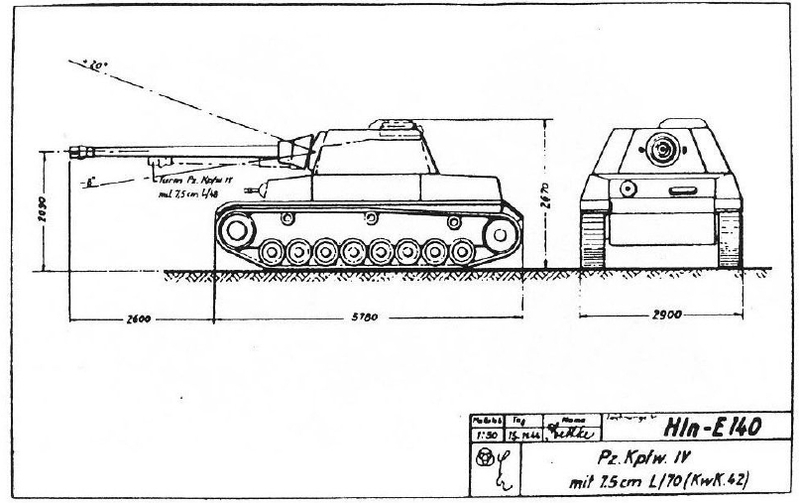 Rheinmetall’s progress was sluggish, as 1 year later, they had not yet progressed beyond the drawing stages as evidenced by drawing H-Sk 88517 “Turm – Panther (schmale Blende)” (English: ‘Turret-Panther (narrow mantlet)’). New requirements were drawn up for a new iteration of the regular Rheinmetall-designed Pantherkampfwagen V Panther turret. An Entfernungsmesser (English: ‘rangefinder’) was to be incorporated into the turret and the gunner’s sight was to be changed to a periscope in the roof. Rheinmetall’s design incorporated the Entfernungsmesser in the turret, but this created a huge hump in the turret roof. It appears this design, combined with the long time already used with no practical results, prompted Wa. Prüf. 6 to move responsibility for designing a new turret from Rheinmetall to Daimler Benz. It seems about nothing from the Rheinmetall’s Turm – Panther (schmale Blende) design was used by Daimler Benz for their Schmalturm design. By 20 August 1944, the first Versuchs-Schmalturm was mounted on a Panther Ausf. G chassis. 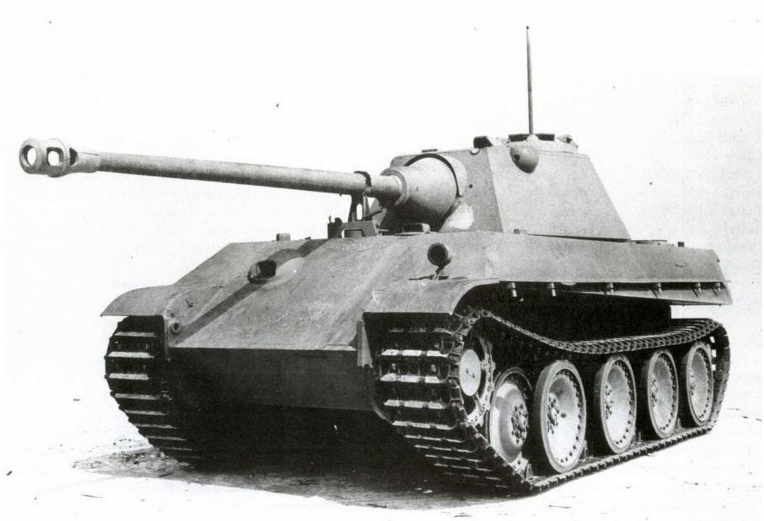 A number of prototype turrets had been produced and tested on and off the Panther Ausf. G. However not a single Panzer IV would ever feel the power of this new armament, even though there were copious amounts Panzer IV hulls, no Schmalturm ever touched its turret ring. None of these projects left the prototype phase, and both the Pz. IV mit Schmalturm and Panther with 8.8cm Kw.K.43 L/71 never progressed further than pencil lines on paper. Two of the production turrets were retrieved after the war by the Allies. The Americans took one while the British took the other and used it for ballistic tests. The remains of this turret can be found in the Bovington Tank Museum. The Author would like to thank Marcus Hock and Herbert Ackermans for additional information. Welcome back, Mark! I hope everything is doing better. how about schmalturm turret armor ? It is displayed under the first image. I believe both vehicles are planned and in the works. Definitely in a future Article. Could you guys do an article on Post WWII use of the German PZ.iv, or perhaps an article on what both sides did with captured tanks? Even inside of the copybooks “PANZER TRACTS” concerning the Panther tank I have found so many informations about this turret. And the pictures are also very interesting. So were the turret sides 60 or 80mm thick? To me it looks more like 80mm but every article always says 60mm. The measurements are given in the Panzer Tracts issue mentioned in the sources. Hmm. Interesting. Edits will be made. What you are referring to are the bulges made to accomodate the E.M.1.32 m rangefinder. There’s three instances of the word “however” under the “Fate” header, all within the same small paragraph. The first one is kinda just stuck on the end of a sentence and doesn’t make any sense. The third one is grammatically correct, but it comes across as repetitive when used right after the second one, and isn’t necessary for the sentence to be coherent.